Sealers and coatings can provide winter protection and/or appearance enhancement to concrete and masonry for years if applied properly. The first component of proper application is preparation of the surface or substrate. Improper preparation of the surface can create problems later, especially with adhesion, but also with appearance. Many coatings require specific 'surface profile' recommendations. A surface profile refers to how rough a surface is based on how it was prepared mechanically. Surface profiles range from heavy scarification/milling to acid etching. V-SEAL provides recommendations for each type of sealer/coating: reactive penetrating sealers, decorative acrylic coatings, and premium topical coatings. The only actual requirement for a reactive penetrating sealers is that the substrate can absorb the sealer. Substrate porosity can be tested by pouring water on the surface or waiting for rain. If water soaks in easily and spreads out, darkening the concrete some, that generally means the concrete is porous/unsealed and will absorb a reactive penetrating sealer. 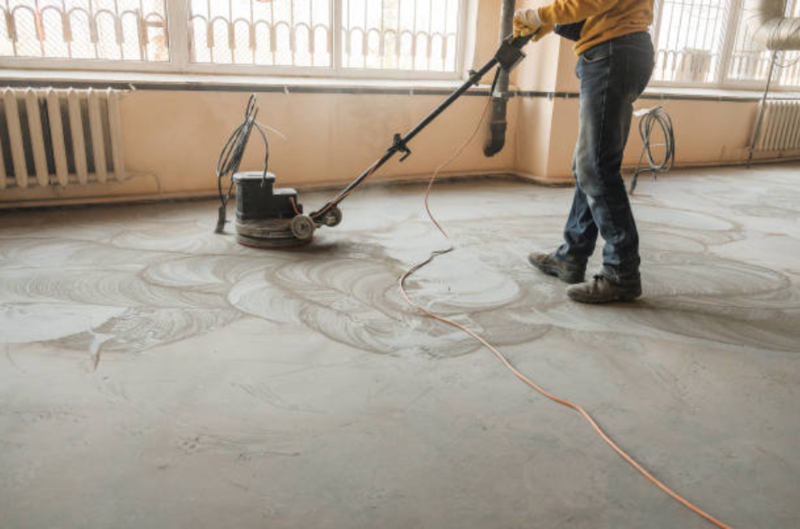 While the only requirement is porosity, we typically recommend cleaning the concrete before sealing to avoid trapping any stains or making them harder to clean later. 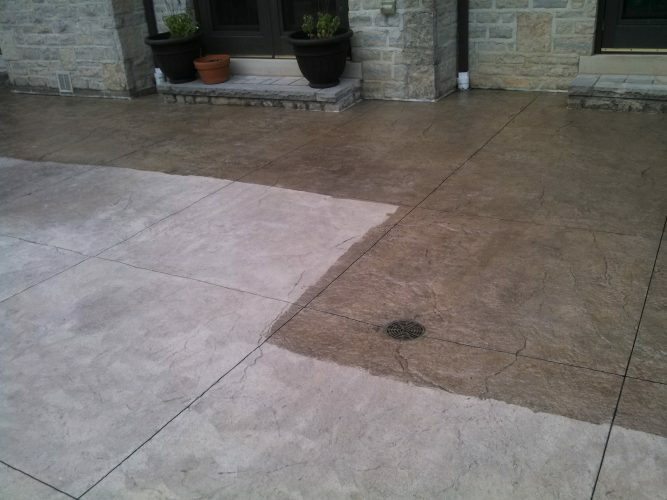 If pressure washing is possible, it is the best way to clean your concrete without the risk of discoloring the surface with a chemical cleaner. For stubborn staining agents, chemical cleaners may be necessary (see below for recommendations). After cleaning, the surface should be allowed to dry completely before sealing to ensure maximum absorption. Sealing a partially wet surface will typically result in less product absorption, and less water repellent characteristics. If the surface is clean, dry, and porous, you are ready to begin your reactive penetrating sealer application. Decorative acrylic coatings don't require porosity like reactive penetrating sealers, but they do require that the surface profile is rough enough for adhesion. When applying directly to the substrate, the surface should be at least as rough as a 200-300 grit grind/sand. Acrylic coatings are made up of acrylic resin and a solvent or water carrier also called a base. When applying over another coating, care should be taken to use the same type as before (solvent/water) to ensure proper adhesion and appearance. Solvent based acrylic coatings provide deep color enhancement will soften and bond to the resin remaining from the last application. Water based acrylic coatings provide less color enhancement and gloss, and will not soften old resins. Because water based acrylic coatings will not soften and bond to cured acrylic coatings, the surface should be 'de-glossed' or lightly sanded to provide mechanical adhesion. If the surface is clean, dry, and rough enough for adhesion, you are ready to begin applying your decorative acrylic coating. Premium topical coatings like epoxy and urethane require similar preparation to acrylic coatings, but are less breathable than acrylic coatings, so moisture transmission must be accounted for on applications that are on grade or below grade. Taping a small piece of plastic down in a few areas is a good way to find out if there is underlying moisture. If the area under the plastic darkens after a day or two, there is likely moisture pushing up through the surface, and a calcium chloride moisture test should be performed to measure the amount of moisture transmission. Test results above 5lbs/1000sf/24 hours generally have to be controlled before applying coatings. If this is the case, a reactive penetrating sealer like our V-SEAL 101 should be used to reduce the amount of moisture passing through the surface. Surfaces should also be as rough as a 200-300 grit grind before application of premium coatings. When applying premium coatings in succession, they should be applied during the re-coat window to ensure chemical bond between the coatings. If the re-coat window passes, the surface will need lightly ground/sanded with 200-300 grit again before applying the next coating. V-SEAL offers cleaners for all types of staining agents. Our concentrated V-SCRUB HD is a strong alkaline detergent designed to clean dirt, grease, and oil stains. Our V-SCRUB ETCH is a concentrated acid designed to clean reacted stains like rust, efflorescence, and leaf stains, or etch concrete when used in stronger concentration. Our ReKRETE is a waterless resurfacing cleaner for oil and other hydrocarbons. Our V-SCRUB Natural is a biodegradeable pH neutral cleaner designed for cleaning sealed surfaces without damage to coatings. To speak with an experienced technical advisor about the specifics of your project, contact us at (614)754-4777 or info@vseal.com.